Primary, Upper Elementary, Middle School, and Administrators. Also, follow our facebook page for additional testimonials. Administrators can follow my LinkedIn page also at Angela Bauer. Sarah J., Kindergarten teacher in NSSD 112 in Highland Park, IL: Angela’s discussions allowed me to visualize and plan for better guided math lessons and rotations. She shared several example schedules and engaged math activities. I have more ideas on how to form different groups and how to better differentiate station activities. Thank you for the free math activities and schedules. Sara, 1st Grade teacher in Washington, DC: I had no idea on how to set up guided math before Angela and Ashley trained us. Angela detailed exactly how to set up groups based on data, how to plan guided group lessons, how to change my large group lessons into mini-lessons, and finally how to get grades. Ashley showed us examples of guided math in first grade. I love that Ashley shows the students how to play the math games in guided groups for several days before it goes into a station. Thanks so much. Shannon, 1st Grade teacher in Charlotte, NC: I had tried guided math using another national guided math program. I couldn’t figure out many aspects of running guided math and had given up. I attended Angela’s professional development training and was amazed. After the training, I fully understood the framework and the specific details to set it up and maintain it in my classroom. Ashley was especially helpful with her ideas for setting up a fact mastery station and skills review folders. Angela’s guided math book was icing on the cake that helped me understand the process of changing my thinking when planning for lessons. Jill, 3rd Grade teacher: I appreciate how you reinforced the importance of showing a concept in multiple ways. Your chart of 8 strategies to build mathematical thinking is a useful tool. My kids REALLY enjoyed the change of activities—I do too! Todd, 4th Grade teacher in Highland Park, IL: Guided Math is a way to teach Common Core Standards while hitting All the learning styles. I learned a lot today. You reinforced what I am already doing with large group mini-lessons and provided me with ways to enhance my math teaching even more. You clearly outlined the rotation of groups and how to form them. Thank you for giving us your email for continued support. I’ll be in touch! Since it is so new to me, questions will surely arise. Kristan F., 5th Grade teacher at Seth Paine Elementary: I came back from your workshop and started guided math immediately. I’ve done small group instruction for the past two days. I put together some engaged math activities and some skills review practice. I CANNOT believe the reaction of my students. They were BEGGING me to tell them whether we were going to do “guided math again today!” I can’t thank you enough. You were the inspiration I needed to give me the courage to just jump in. Annie, upper elementary teacher in Chicago, IL: Awesome presentation. I never thought I would be excited to teach math! Angela Bauer’s enthusiasm was contagious. The best idea I learned was how Guided Math has the students take responsibility for their learning. Angela gave us schedule handouts, lesson planning sheets, assessment checklist chart, and strategies for asking good questioning techniques. I really understand Balanced Guided Math now after seeing the format and learning the scope of each area. Ben, 5th grade teacher in Chicago, IL: I understand Guided Math better now because this presentation focused on logistics of how guided math will operate smoothly in the classroom. I liked the binder system for organization of papers during guided math. Thank you for the “To Do” list to get started. Susan, upper elementary teacher: Thank you so much for the information about how to use DeCartes data from NWEA to plan for teacher-led guided groups. Also the organizational strategies and practical applications were key to my understanding. Angela’s experience and expertise in the classroom helps teachers in the trenches. It helps that she still is in the classroom. Larry, 5th grade teacher in NSSD 112 in Highland Park, IL: What was the best idea I walked away with today? So many…. Just one? The “Dice Activities for Multiplication” and “Dice Activities for Mathematical Thinking” by Didax. (These resource books provide engaged math activities that promote application of math skills in a simple game format.) I had a limited understanding of guided math before this workshop. Now I’m ready to implement Balanced Guided Math tomorrow! Morry, 6th/7th grade teacher in Chicago, IL: Angela Bauer’s enthusiasm helped me to understand and get ready to make the shift from direct instruction to guided activities. Thank you for the multiple ideas to use these activities on block schedule days. Bryan, 6th/7th grade teacher in Highland Park, IL: The presenter’s confidence and belief in the process made me feel that this is possible. Jordan, middle school teacher in Chicago, IL: I already have groups set up, but the ideas for what to do in groups were very helpful. I learned the art of grouping students and the idea of using math fact practice as a station. Mark, 6th/7th grade teacher in NSSD 112 in Highland Park, IL: It was a good presentation of a new way to teach math that engages students. I learned how to structure a guided math lesson on a block schedule day. Angela went back and clarified concepts for us as we were wrapping our minds around this new schema. “We began with a short introductory training in spring of 2013 and began planning for a full District implementation (eight buildings -180 teachers) for 2013-2014. During the 2013-2014, North Shore School District 112, had training sessions (K-6) with Ms. Bauer. Angela’s trainings were engaging, informational and well-received by our diverse staff. Over the course of the training sessions, Ms. Bauer adapted her presentation and materials to the needs of each grade level. Angela presented the teaching staff with hands on materials for their immediate use during her presentation. She was energetic, knowledgeable and “down to earth.” Staff left Angela’s training well-equipped to start Guided Math in their classes in a slow methodical manner. What was wonderful about Angela’s presentations were they were a perfect blend of theory and application. Explaining to teachers the theory of why Guided Math is an effective instructional strategy is a complex task but Ms. Bauer explained it clearly and concisely. The theory was brought to practice for our teachers because Angela lives in their world. She was and still is aware of the constant demands on a teacher today. Teachers were aware immediately her knowledge and expertise. Angela also demonstrated with her data – Guided Math’s significant impact on student performance and student Math confidence. As of Spring 2014, our teachers are reporting impressive student results using Angela Bauer’s Guided Math program. In my past five years, I have not seen an instructional strategy been put into action so quickly and effectively. As stated previously, our teachers left Ms. Bauer’s one day training session equipped with the necessary tools to implement Guided Math immediately. As Math Curriculum Coordinator, I was Angela’s liaison and main contact with 112 Administration and teaching staff. She was a true pleasure to work with —and to be in her presence. Angela is a true professional in every sense of the word-kind, courteous, punctual, hard-working, energetic and reflective. We worked quite effectively together and our entire District (most importantly, our students) have benefitted from her immense knowledge and expertise. I would strongly recommend that your District train with Angela Bauer’s Guided Math program. 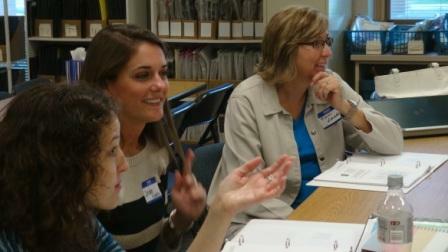 Watch a video that Susan made after Guided Math with Angela Bauer training.